The article looks at bike share programs and what makes them successful. Contrary to popular belief, weather or terrain are not as important as the attitude that getting on a bike is more important than anything else. Anything else includes riding without a helmet. One common denominator of successful bike programs around the world — from Paris to Barcelona to Guangzhou — is that almost no one wears a helmet, and there is no pressure to do so. The article does not deny that wearing a helmet prevents head injuries. The article, like numerous studies have shown is that head injuries are exceedingly rare in cycling. Yes, there are studies that show that if you fall off a bicycle at a certain speed and hit your head, a helmet can reduce your risk of serious head injury. But such falls off bikes are rare — exceedingly so in mature urban cycling systems. The balance is the risk of a head injury to the risk of other issues: “means more obesity, heart disease and diabetes.” Not cycling also leads to more pollution in our cities. Mathematical modeling shows the risk of not cycling outweighs the risks of cycling without a helmet 20 to 1. 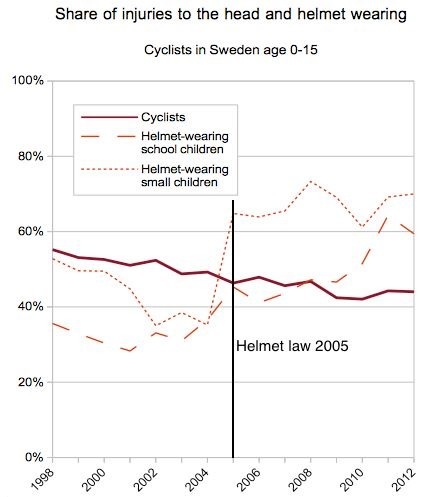 Although not scientific, this is fairly clear that helmets may inhibit bike riding with bike share programs. A two-year-old bike-sharing program in Melbourne, Australia — where helmet use in mandatory — has only about 150 rides a day, despite the fact that Melbourne is flat, with broad roads and a temperate climate. On the other hand, helmet-lax Dublin — cold, cobbled and hilly — has more than 5,000 daily rides in its young bike-sharing scheme. Why should you understand this? Because public perception about helmets is important in promoting and encouraging the program. If you complain to government officials about bike share programs not requiring helmets, you will pay for that complaint with your wallet. Heart attacks and the problems of obesity will cost more than the rare head injury. Instead of requiring helmets, we need to make cycling safer. This is my favorite quote from the article. Before you hit the comment button and tell me that you know someone whose life was probably saved by a bike helmet, I know someone, too. I also know someone who believes his life was saved by getting a blood test for prostate specific antigen, detecting prostate cancer. Before you comment about your friend whose life was saved, which I have no doubt, remember I’ll respond with the above quote. Thanks to Brad Waldron at Kali Protectives for giving me the visual to explain this. what is there to absorb energy? A helmet does not work by being a hard surface to protect your head from head injuries. Hard surfaces protect your head from pointed objects. Think Knights of the Round Table and spears and arrows. If you are riding a bike or skiing and someone is shooting arrows at you, you need a hard helmet. Hitting the ground is different. Your brain bounces around inside your skill causing damage; a concussion. 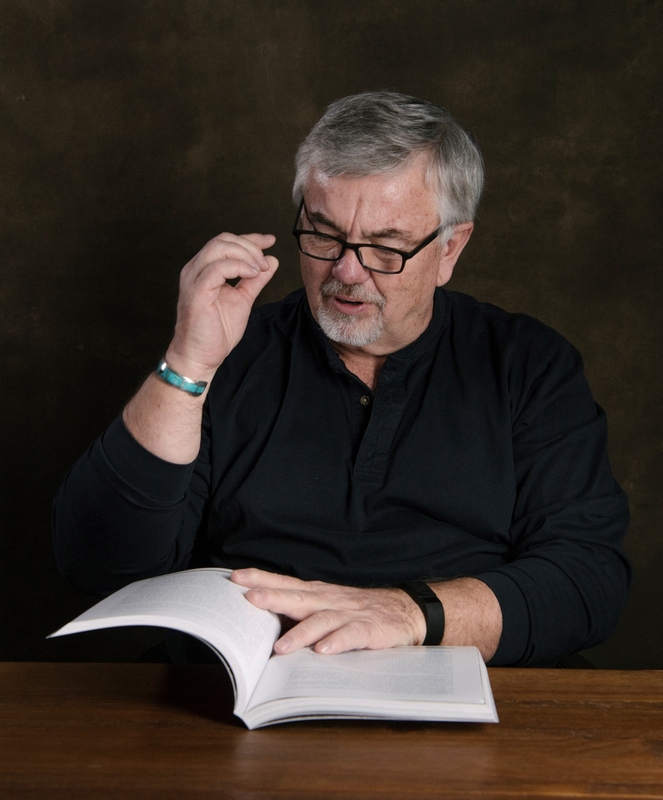 You need something to absorb the impact and soften the blow or extend the time the impact (force) is being applied to your head, which softens the blow. Helmets as they are currently used, do not do that. Think about the issue this way. If you drop a weight on an egg, say 11 pounds from 4 feet the egg is going to smash. If you put a book on top of the egg and drop the 11-pound weight the egg is still going to smash. The amount of energy transmitted to the egg maybe reduced by the book; however, the energy reduction is not enough to protect the egg. A Bicycle or ski helmet is the same way. There is some energy absorption, but not enough to protect your brain. If you want to know why I picked 11 pounds from 4 feet that is the test for helmets. Watch Video of cycling helmet testing. No one is testing the force on the head, if the helmet absorbs any of the force, or if the impact broke your neck. On top of that, always remember the helmet is tested with the impact landing in the center top of the helmet. When you fall to make sure you drive your head into the ground hitting the helmet in the center on top of your head to receive the maximum protection. See for yourself. This is the UIAA (European) Test for Helmets. This test is for climbing and some European ski helmets. 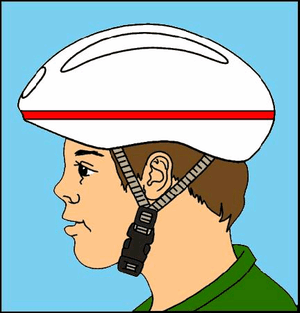 In the US, a bike helmet and ski helmets are not tested for lateral force, slippage or chin strap strength. There are some organizations that test the helmets to greater extremes such as Consumer Reports, but all they are doing is testing the helmet. They are not looking at whether the helmet protects your head. 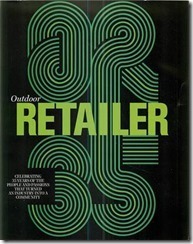 See Consumer Reports Bike Helmet Testing. We are not testing whether a helmet looks good after an impact. We are testing whether the helmet protects your head from an impact and the drop test does not test that sufficiently, if at all. 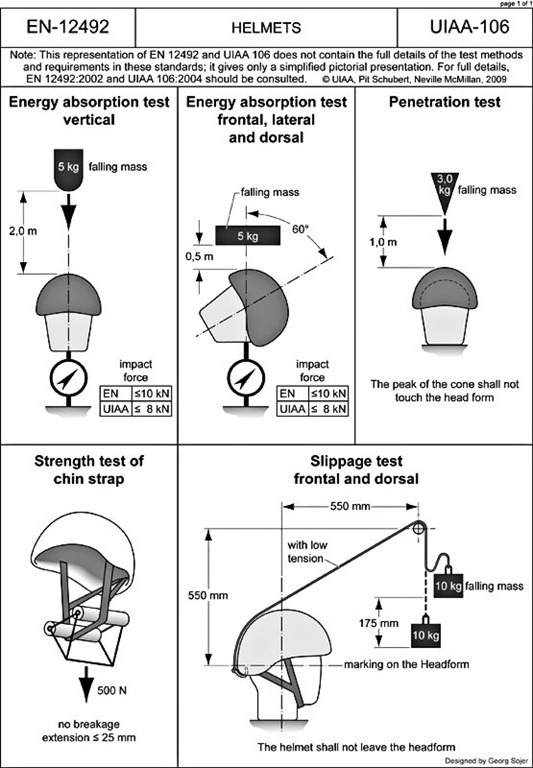 If you want to test this yourself, figure a way to stick an egg under a helmet and drop a weight on the helmet. The egg is still going to crack or break. Yes, your head is not an egg. It is just easier to see the results with an egg. The helmet did not decrease the pressure enough to protect the egg. The injury still occurred. If you could take the time to measure the breaking strength of an egg and then start below that number and drop weights on the helmet you would see a difference eventually which would be the amount of protections the helmet provides. However, that number would be small and probably no different from what a plastic bowl would do. If you really want to test this, go buy two eggs. Drop one from 15 feet and see what happens to the egg. Tape the other one in your helmet and drop it from the same height. The egg will crack (and make a real mess in your helmet). Yes, your head is not an egg. Yes, a helmet will protect you from minor hits. Yes, a helmet is probably better than not using a helmet, unless the process stops you from riding a bike or skiing. The health benefits of activity out weight the risk of a head injury. If that is the case, then why not wear a helmet when you drive, shower or work in the kitchen. All three have a far greater risk of head injuries then cycling. However, we have not looked at whether using helmets deters activities. See TEDxCopenhagen – Mikael Colville-Andersen – Why We Shouldn’t Bike with a Helmet. I love the fact the in the video Mr. Colville-Andersen lets you know that the helmet tests were designed for pedestrians wearing helmets. 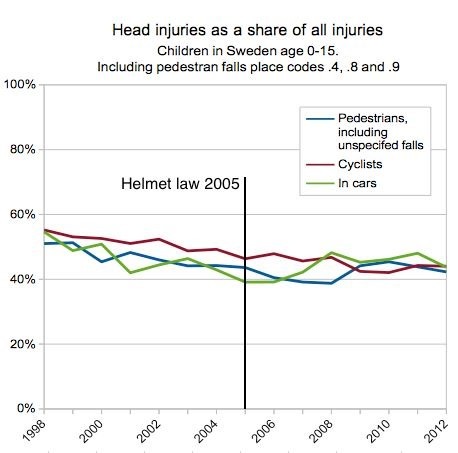 Also he points out that helmet laws do not reduce head injuries. They reduce the total number of people riding bikes, which results in a reduction of head injuries. Nor have we looked at the issue of the advertised protection versus the real protection afforded by a helmet. Finally, we have not looked at whether wearing a helmet makes you react in a way to protect other parts of your body rather than your head. If you fall you natural protect your head. Your arms go out to keep your head form hitting the ground and then your cradle your head from being hit or hitting the ground. This accounts for tons of videos and statements when people hold up their battered helmet and say my helmet saved my life. 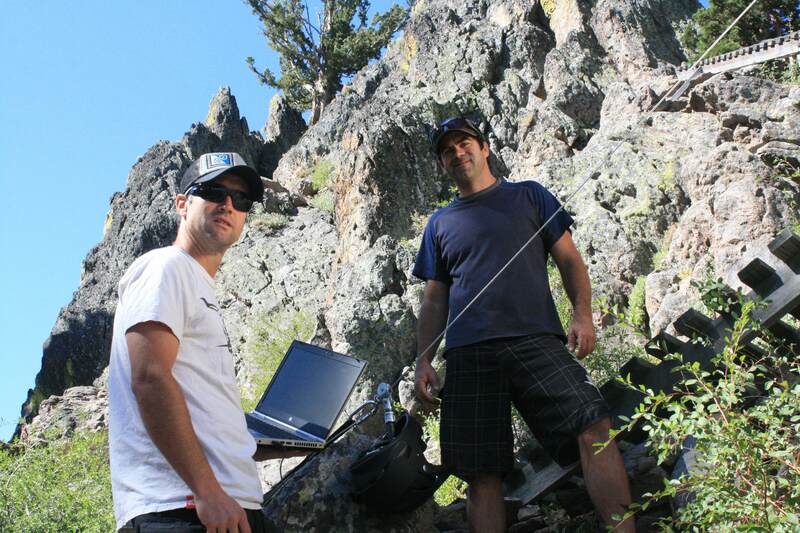 But without bike and ski helmets where would we mount our video cameras? A father of a deceased skier pushing for a helmet law in New Jersey. California bill to require helmets on skiers and boarders under age 18 dies lacking governor’s signature. Does being safe make us stupid? Studies say yes. Great editorial questioning why we need laws to “protect” us from ourselves. Mixed emotions, but a lot of I told you so. Recent UK poll shows that 10% of cyclists would quite biking if there was a compulsory helmet law. Survey of UK physicians shows them against mandatory bicycle helmet laws.